Has anyone read the “Twilight” series by Stephenie Meyer? In the first book, Twilight, there’s a girl named Bella who is going to a new school. She has just moved in with her dad. She meets a guy named Edward who turns out to be a vampire! They start to fall in love. I don’t want to give too much away, so I won’t write any more details. I’m reading the second book now, called New Moon. I loved the first book, but the second book is getting on my nerves. I hate what’s happening right now! Edward thinks that Bella is in danger by being with him. And he does something that isn’t making me happy right now. But I know nothing can stop true love! I wonder what it would really be like if your next-door neighbor was a vampire! You’d have to lock up all your pets. Not to mention, yourself, too. It would be terrifying! Maybe I could talk him into being a vegetarian. Or maybe he could drink animal blood instead. I’m glad that vampires are mythological. But they are fun to read about and watch. There’s also a TV show called Buffy the Vampire Slayer. I’m not sure if there’s a book series, too, but the shows are good. I only just started watching them because my friend brought some over. This is my first article on Opinion Forum. My uncle, Tom Carter, is the editor, and he asked me if I would like to write articles. I’m going to start doing them every couple of days, if I can. It’s really fun, and I’m excited about doing it! You can read my biography on the Authors page. 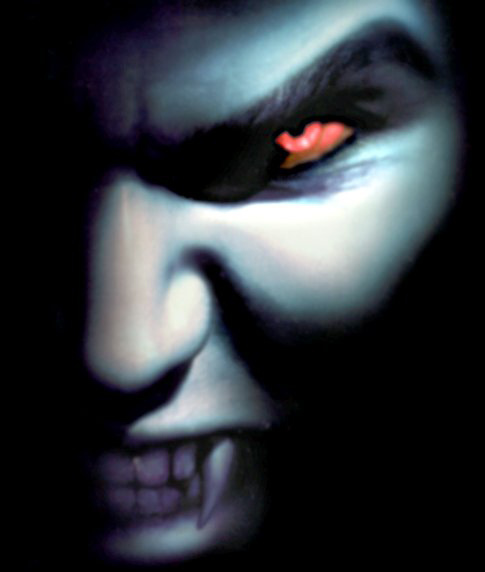 If you have some ideas about vampires or anything else, please write a comment for me! UPDATE: I finished New Moon in the “Twilight” series. I’m on the third book now. New Moon turned out good! I’ve just returned from watching “Twilight” with my daughter. 🙂 I found the book to be better than the movie, personally. But the character of “James” is fantastic in the film. I hear they are great–from Meghan, my granddaughter, but I don’t have time to read. I hear the movie is not understandable, unless you read the book, true??? I would love to see it, I do love, love, love vampires. Have you read The Vampire Lestat? Amber, it is great. LOL! I don’t have a good enough imagination to try to figure out what dating a vampire would entail. I am sure you wouldn’t be able to turn him vegetarian, though. You’re young – but remember this for later. NEVER, but NEVER, expect to fundamentally change a man you’re thinking of marrying. Either accept him as he is or move on. You can accentuate someone’s good qualities and aid him (or her) in controlling his bad qualities, but you can’t change a man or a woman’s basic personality, likes, or drives. Love allows us to be better versions of ourselves, but it doesn’t allow us to escape ourselves. personalities. Your writing is very good! Try to continue posting here – there’s nothing that improves your writing like writing. Amber, “Vampires” is great! Very interesting, and funny, too. Keep up the good work! I’m looking forward to your next one. “Vampires” reminds me of all the vampire late-nite movies I watched, wondering what went on in Transylvania to scare up so many creepy folk tales. Now that your Uncle Tom lives near Transylvania, maybe he can shed some light on the vampire homeland. Looking forward, Amber, to hearing about what else you find interesting as you explore the world of books. You have inspired me to read Twilight…someone just lent it to my wife and I am just waiting until she finishes it. Amber, I did not see Twilight, but my 16 year old daughter did and she loved it. I hope to see it soon as I like that kind of movie. I am an old friend of your uncle, underline OLD, and Tom and I go back a good many years, even back to Korea in the mid 70’s. (That’s the 1970’s, not the 1870’s! just so you’ll know!) Anyway, maybe I can get my daughter to get into this blog stuff, but I have to make sure she does her homework first! All the best with your writing, you have a good style and a critical eye for the details you want to put in. Good job, look forward to more of the same.